I know I wax eloquent about Egyptian onions far too much, but if you haven't grown any before, you must give them a shot! Right now, they're the only thing (beyond thyme) which is actually green and growing in the garden. I have three beds of Egyptian onions, each one about three feet by six feet and full of about a hundred plants. One bed is at the furthest north edge of our garden where the winter sun is able to peek up over the hill and warm the ground for nearly the full day --- this bed feeds us green onion tops all winter long. The two beds on the south end of the garden sit in ground which stays frozen for weeks at a time due to shade from the hill --- these are onions I've been saving for when I'm desperate for a hint of freshness. Today I decided I was desperate. Out I went, trowel in hand, expecting only to get a crisp white bulb. But once I peeled back the speckled brown nubbins poking up out of the ground, I found the most tender green shoots imaginable. 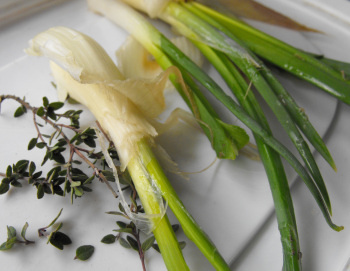 Winter delicacy --- new Egyptian onion shoots! Good thing I planted two extra beds so that we can eat them whole and still have enough left to propagate come spring.